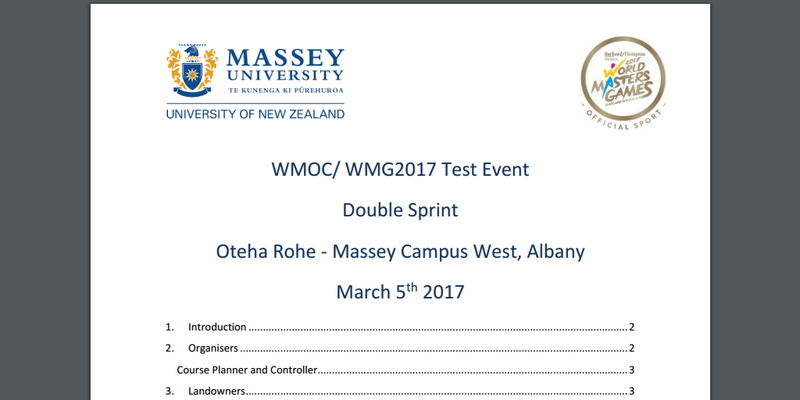 The final Bulletin has been published for the 5th March 2017 orienteering double-sprint event on the Massey Campus, Albany. The 5th March 2017 event is being put on to trial all the systems and processes we are assembling for the biggest orienteering carnival New Zealand has ever seen. Online Entries for the event close 11:59pm Tuesday 28th February 2017. Costs will be the same as for Auckland SummerNav, except ALL CHILDREN WILL BE FREE, as it is Childrens Day. Costs are listed in the Bulletin. This event will give our event personnel a trial run in their roles and give Auckland based Oceania and WMOC/WMG2017 competitors an opportunity to experience how these events will be run. For everyone else it’s an opportunity to experience what a real World Championship orienteering event is like without travelling to the other side of the world. Of course, for those who have attended prior world championships, wearing the running strip of another country is compulsory. It is suggested you take 4 mins to view and get a feel for what the organising team is trying to create. Please feel free to give the organisers constructive feedback on this bulletin, and the procedures on the day, so we can get the real thing right!